All degree programs have a program pathway available to guide students in the completion of their degree. Students are encouraged to discuss their program pathway with an advisor. College-level English and Mathematics courses should be completed within the first 24 credits of their program. Program pathways have been designed to include college-level English and Mathematics in the first semester. In compliance with CCRCCA, HCC recommends that students take all required developmental courses in sequence without any gaps in registration. Additionally, students are encouraged to enroll in college-level English and Mathematics in the semester immediately following the completion of developmental courses. Student academic records are maintained in accordance with the Family Educational Rights and Privacy Act of 1974 as amended. A confidential record of the admissions credentials and academic performance of each student and former student is kept permanently in the Records Office. Access is granted only to such duly authorized personnel of the College who have legitimate need for information and to the student. Students have the right to review their record by arranging a conference with the registrar. Persons requesting telephone information must identify themselves and state the reason for the inquiry. Without the written consent of the student or former student, the only information that may be given is directory information and verification of dates of attendance. Release of student transcripts to educational institutions and other agencies is in accord with The Family Educational Rights and Privacy Act of 1974 as amended. Official transcripts are sent directly to the institutions concerned and issued to students in sealed envelopes. Transcript requests can be accessed on WebAdvisor or the HCC website. HCC uses the authorized third-party agency, Transcripts on Demand, and transcripts are processed within two business days. During peak periods, please allow for additional time. Transcripts are available to students at a cost of $5.25 each. For more information, go to www.hagerstowncc.edu/transcripts. The normal maximum course load for a full-time student who is not on probation is 18 semester hours of credit. The number of class hours will vary according to the number of laboratory courses in the program. Students, full- or part-time with a cumulative average of “B” or better at HCC, may, with the consent of the director of advising and registration, take credit hours in excess of 18. The grade of “I” (incomplete) is awarded only when the instructor has determined that illness or unforeseen circumstance has prevented the student from completing all of the course requirements. The student should already have completed most of the course requirements (at least 80%) and be beyond the deadline for receiving a “W” grade. It is the student’s responsibility to complete a form entitled Request for Grade of Incomplete, which requires the signatures of the student, instructor and director of the respective academic division. Also, the student should deliver the form to the Records Office before the final exam week. The student is not required to register for the course again, but must make up the work before the instructor’s deadline. The deadline will not extend beyond the end of the next semester or the instructor will assign an “F” as the official grade. The instructor will change the “I” to a letter grade within fifteen work days from the date that the student completes all of the remaining course requirements. After reviewing the written materials, the division chairperson will schedule a conference with the student and the faculty member within 10 work days. The results of the meeting will be documented and will include the signatures of all three participants. A file of all written materials will be maintained by the division chairperson. If the appeal is not resolved, the student has 10 work days from the date of the conference to appeal the grade, in writing, to the Vice President of Academic Affairs and Student Services. If the student or faculty member disagrees with this decision, a request for an appeal to the College Hearing Board can be made, in writing, to the Vice President of Academic Affairs and Student Services, within five work days. The College Hearing Board will consist of three faculty and three students. The Hearing Board will be chaired by an administrator, who will vote only in case of a tie. The student will be notified via registered or certified mail, of the day and time of the hearing. The Hearing Board will convene in a closed session no more than seven calendar days after the request for a hearing has been made to the Vice President of Academic Affairs and Student Services. If the student wishes to have an advisor present for the hearing, the individual may not be an attorney and may include a spouse, parent, other relative, or friend. The student must notify, in writing, the Vice President of Academic Affairs and Student Services regarding the presence of an advisor at least one calendar day before the hearing. The advisor may confer with the student during the hearing, but may not address the Hearing Board. Following the presentations by the student and the faculty member, the Hearing Board will vote on its decision. The Hearing Board chair will inform all parties that the Vice President of Academic Affairs and Student Services will receive the decision in writing. The Vice President of Academic Affairs and Student Services will notify the student, the faculty member, and the division chairperson within five work days after receiving the Hearing Board’s decision. If the Vice President of Academic Affairs and Student Services is unavailable, it is then the Dean of Student Affairs’ responsibility to do so. Students who are academically dismissed and feel that particular circumstances warrant reconsideration of their status may submit a written petition to the registrar for consideration of the appeal. This petition should be received one month before the first day of class of the semester in which the student wishes to return. The Academic Dismissal Appeal (re-instatement) form is available in the Records Office or online at www.hagerstowncc.edu/admissions/forms-documents. If a student has not more than 30 completed credits at HCC and has not been enrolled at HCC for at least two years, the student may request academic amnesty from the registrar. Academic amnesty may be granted only once to any student during that student’s academic career at HCC. If the amnesty is granted, the student’s grade point average (GPA) will be based only on those courses taken after the amnesty is granted. This is a mechanism by which a student may be given a second chance. Please note that course grades which are no longer factored into your academic GPA will still count in the calculation for Financial Aid Satisfactory Academic Progress (SAP) requirements as mandated by federal law. Students must complete a change of major form in the Academic Advising and Registration. Students may at any time change their programs by submitting an official change of major form. Students, who are readmitted, change their academic program or change their status from special to degree or certificate-seeking must follow the program requirements of the catalog in place when the change is made. Students must complete a change of major form in the Academic Advising and Registration Office. Students may repeat a credit or developmental course two times. Under special circumstances, they may appeal to the Vice President of Academic Affairs and Student Services to re-take a course more than two times. The college posts withdraw deadlines for each semester. Students desiring to withdraw from the College at any time during the academic year may do so online through WebAdvisor within the published deadlines. Students who fail to withdraw in accordance with stated regulations receive failing grades in all courses scheduled during that semester and forfeit their rights to any tuition refund. If a student fails to meet the deadline(s) but still wishes to withdraw, a Registration Appeal Form must be submitted to the registrar. Learn more at www.hagerstowncc.edu/registration/refund-policy. 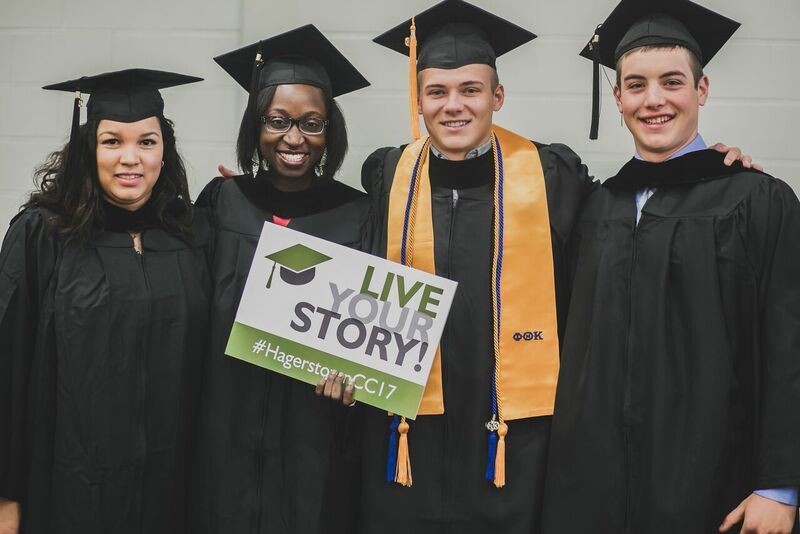 Annual commencement ceremonies are held each May and December (beginning December 2016), and are presided over by HCC’s president. The commencement ceremony is a traditional academic service and signifies the completion of the degree or certificate being awarded. Students completing a degree or certificate program with 30 or more credits are eligible to participate in the commencement ceremony. Only students who have filed an application for graduation and have met all requirements will be permitted to participate in the ceremony. All candidates for degrees, certificates, and letters of recognition should submit applications via WebAdvisor by the published deadline date. Questions regarding this process should be directed to the registrar. Students must choose two courses from the approved list according to the specific requirements of their program of study. Internships provide excellent opportunities to gain career-related experiences and workplace competencies in a student’s chosen career field as well as to obtain skills that are valued by employers when hiring new staff. The eligibility requirements to participate in an internship include: active enrollment in an HCC Degree or Certificate program, completion of the internship application and submission of a resume, 2.0 or higher Grade Point Average, completion of 50% or more of the major’s program requirements, approvals from faculty, division director, and Vice President of Academic Affairs and Student Services or the Dean of Students. All Internships need to be supervised by a faculty member who is responsible for approving internship sites, developing learning outcomes with internship site supervisors, and providing faculty supervision during the internship experience. For more information contact the Coordinator of Internship and Job Services at 240-500-2260 or visit www.hagerstowncc.edu/internships. Application deadlines: Fall Semester-July 31st, Spring Semester-December 15th, and Summer Semester -April 15th. Nursing and Health Sciences clinical experiences are governed by third-party accrediting regulations and are coordinated through the Nursing and Health Sciences Divisions.